Comfortable half in-ear design, portable design, enjoy music whatever in hiking, working or studying. Ultra-lightweight, digital in-ear stereo wired earphones delivering stunning studio-quality sound. 8mm Large Earphone Drivers provide Crystal clear, Top audio performance with driving bass. 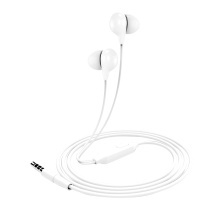 3.5mm plug: compatible with most music players, such as smartphones ( for iPhone, Samsung, Galaxy ), tablets, PC, MP3 or professional audio players. Included the volume adjustment, music and call control, convenient to use. more comfortable to wear, more wonderful to hear.